In 2011, Garfield Eckberg and his wife Marjorie received an Honorary Life award for his work representing the Farm Bureau in Minnesota. 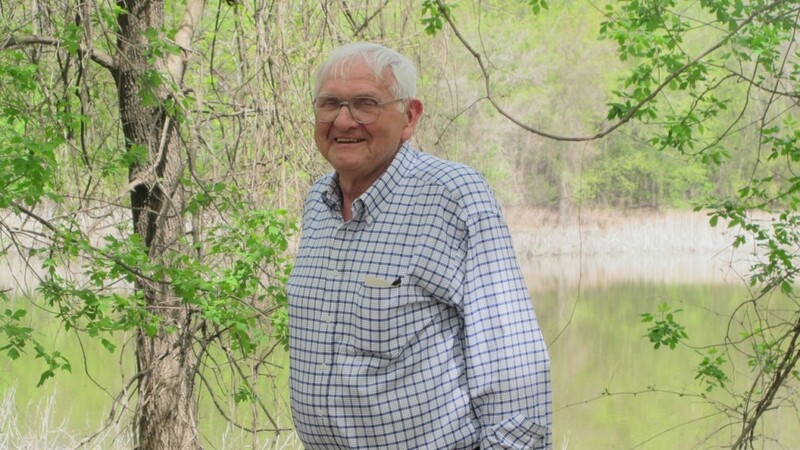 As a fourth generation farmer from Nicollet County, Eckberg sat on Governor Arne Carlson’s Citizen’s Advisory Committee which recommended how to clean up the Minnesota River in 1994. I recently met Garfield at the St. Peter Treaty Site Center, the headquarters of the Nicollet County Historical Society, where historic changes on the land and water took place, including the 1851 signing of the Treaty of Traverse Des Sioux. Here, he has served on the Board of Directors and helped to implement historic preservation of architectural structures, old trading posts, and accounts of a time and place that came to impact 24 million acres, nearly forty percent of the state of Minnesota. He framed his personal guidelines here, that day, for working on the Minnesota River. “Change what you can change and don’t try to change what you can’t change,” he said. Based on what he learned about the condition of the river back in 1992, Eckberg resonated with the charge to make the river fishable and swimmable. He described the need to address sources of high levels of bacteria found near centers of higher population. This can be found in phosphorous which deprives the water of oxygen – specifically, with unsewered and under-sewered communities. Since the Citizen’s Advisory Committee’s recommendations of 1994, an estimated $800 million dollars have been directed toward point sources such as sewage treatment plant upgrades and the construction of new treatment plants. In addition, point of sale laws on home sale transfers have triggered septic inspections which have helped lower bacteria levels as well. This has recently resulted in much lower phosphorous and bacteria in the river which now allows enough oxygen to support fish, mussels, plants and other life in the river, according to the Minnesota Pollution Control Agency report in 2012. What else was recommended to be changed? For Eckberg and his ancestors, change and adaptation have prevailed through the generations. Five generations ago, Eckberg’s paternal great grandparents emigrated from Sweden to the United States. They were informed that new land was opening up in Minnesota. “So they loaded up their belongings in a wagon, a team of horses, and they had a cow tied behind so they had milk for the small children. And they proceeded to move west and they crossed the Mississippi by ferry. They got on the west side of the river and came up the Mississippi River up towards Red Wing and then came across what’s now called the Big Woods to Henderson. From there they stopped and got their instructions on where their land was that they were going to live on,” said Eckberg. They came to St. Peter in 1857 and went up to the farm where Eckberg resides today, ten miles north of Swan Lake. Since then, five generations of Eckbergs have changed how the land has been farmed over the years from oats and dairy, to alfalfa and livestock, to wheat, and presently, corn and soybeans. Eckberg remains resolute that farmers have been responsible on the land, and too often blamed for the problems of the Minnesota River. He believes the use of alfalfa and manure has helped save the residue during storms and improve the tilt. He believes crop rotation with more legume and access to animal manure, applied with precision, has also improved the tilt, causing less erosion in the river. He also believes in the benefit of tiling to make the land more productive and noted a new program to close the open tiles in the field. His land still uses the original tiling installed in 1915, just a few years after the first dredge went through to open up drainage in the area. Noting lessons from the past, Garfield stressed the importance of putting conservation measures into the current farm bill, just as it was important back in the 30s when the Dust Bowl destroyed the farmlands. “My Dad talked about coming to St. Peter years ago and there would be sand drifts the size of snow banks,” he said. Eckberg stressed how farmers have adapted quickly in their practices and pointed to benefits from conservation measures that save the soil, like more grass and planting trees to keep the wind down. He credits the land grant system from the Morrill Act of 1862 and the establishment of the county extension programs like 4H and the Farm Bureau, all designed, per Eckberg, to teach people how to farm wisely and save the soil. Over lunch we discussed more changes in conservation practices that Eckberg has heard about but not yet seen – like bioreactor systems and control structures. He noted the change in market dynamics and economics as driving how the land is farmed today, including conflicting interests between the profitability of farming the land for productivity and implementing conservation measures. “Now, with the big markets opening up, a lot of this CRP (Conservation Reserve Program) land is coming back into production, and with that is coming more highly erodible land because farmers are producing for that market. So you’ve got this out there and that’s pretty much the present day situation,” he said. Garfield took aerial photographs from a cardboard camera while returning from Washington D.C. in earlier years. 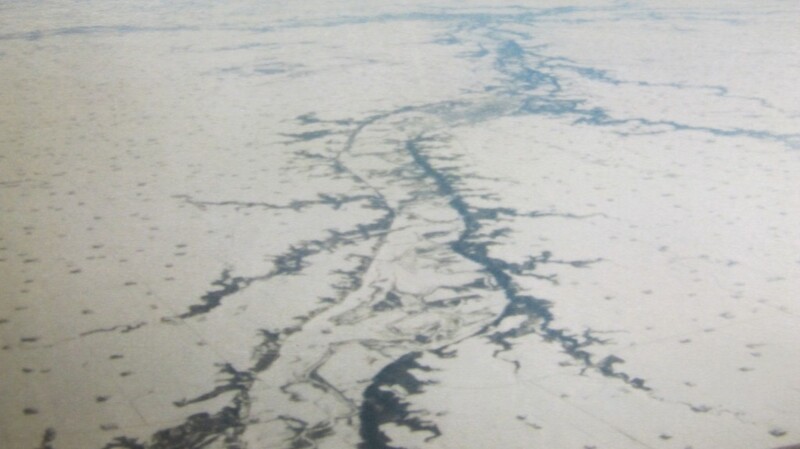 Here, he showed how the pathway and glacial remains of the Minnesota River Valley were self-evident. He pointed to some of the natural rock, geology and regional soil types, some of which have highly erodible features. 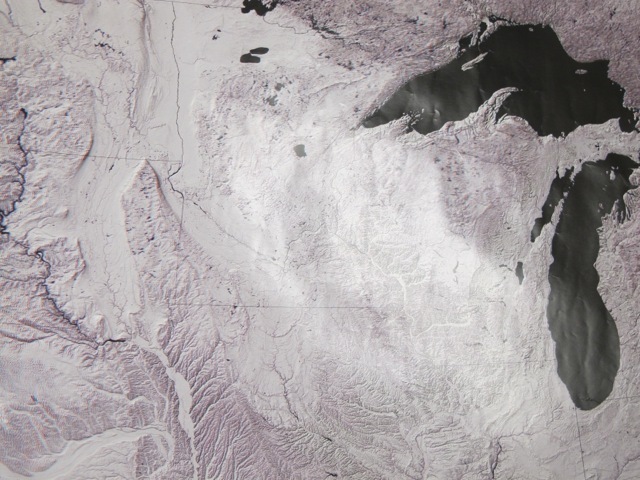 Pouring over maps from the University of Minnesota’s geology department, the width of the floodplain from the route of Lake Agassiz’s flow also became apparent. And what can we hold onto? For Eckberg, it’s history and a love of the land which he intends to pass down to the next generation. 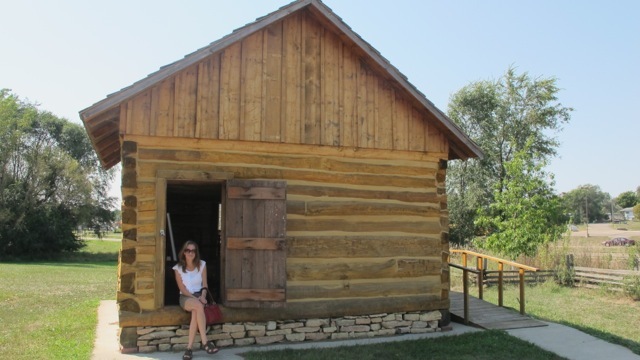 He’s worked with great determination to preserve a one-room school house in the town where he was raised, and has moved a log cabin where settlers lived in earlier years onto the property of the Treaty Site Center. On that same location, Eckberg helped facilitate a survey of the property to trace the exact location where Native American tribes first lived and crossed the river on a land formerly known by the Dakota Indians as Oiyuwege, meaning “the place of crossing,”. Here, french explorers came to trade and settler communities gathered and learned to cross the river as well, where it is primarily shallow and narrow. This part of the Minnesota River was later named by the settler community as Traverse Des Sioux. As we walked by an old cottonwood tree still standing proudly on the sunny bank of the Minnesota River, we listened to the rustle of its leaves. Garfield Eckberg is confident that tree stood tall through the comings and goings of many tribal chiefs, traders, settlers and soldiers of the U.S military, through many exciting and painful winds of change. 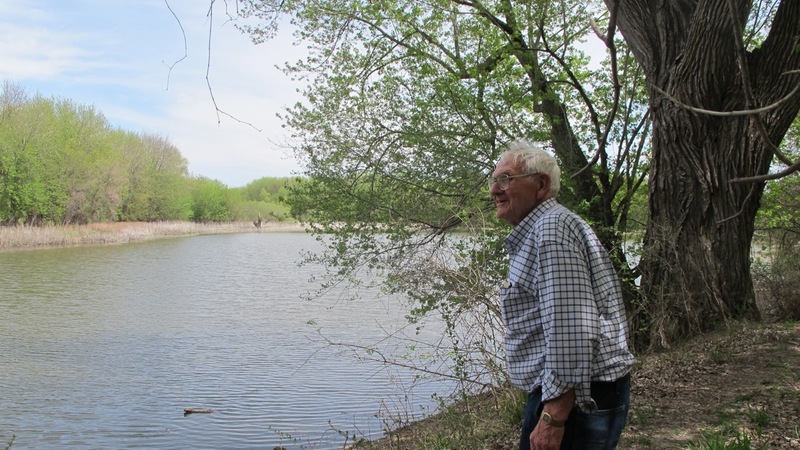 Note: To read the official recommendations to the Minnesota Pollution Control Agency by the Citizen’s Advisory Committee, go to the Voices of the River story on John Hickman.